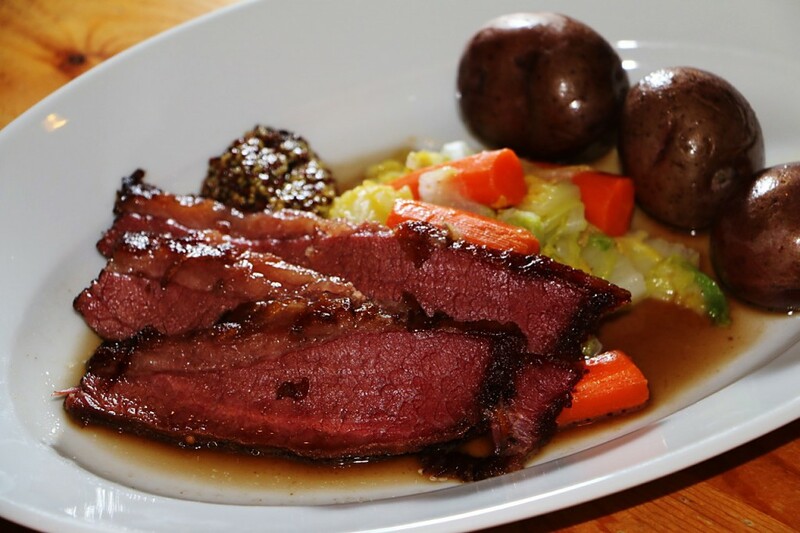 For years, I tried simmering the corned beef along with the veggies, but that always left me feeling as unfulfilled as a night out at a crappy pub on this high-holy drinking day. The timing is too hard to judge, and you’re inevitably left with undercooked beef, overcooked carrots and potatoes, and mushy tasteless cabbage. So for the past few years, I’ve changed my strategy entirely. Braising the corned beef in stout (Guinness, of course) and cooking the veggies separately transforms this meal into something almost…elegant. It’s like an Irish version of high-end barbecue. Of course you’ll need some Soda Bread to go with this meal! Last year Willa and Phoebe wouldn’t touch this. 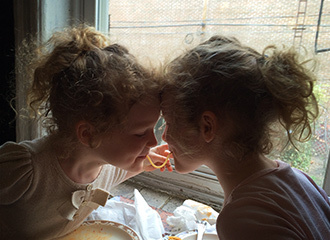 This year was only marginally better—a few bites of the beef, potatoes, and carrots, none of the cabbage. But they are getting there. Anyway, it beats being in a crappy bar listening to House of Pain all night long. 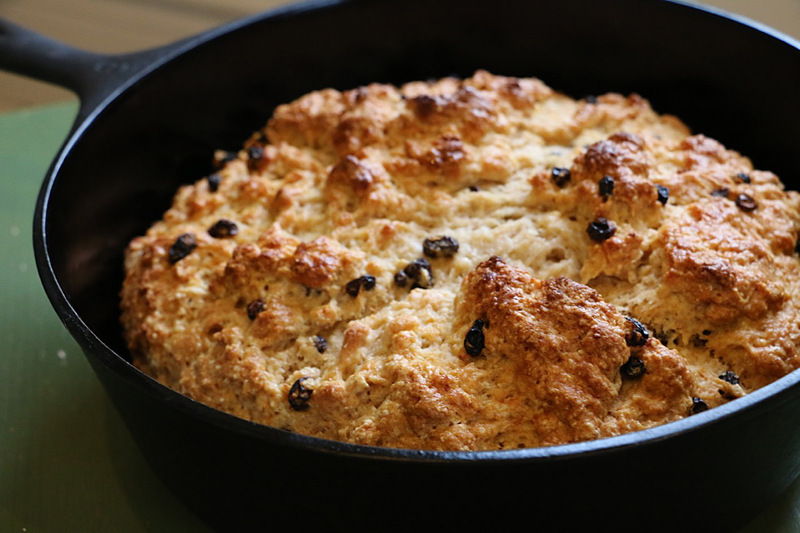 And it’s a great excuse to make some bastardized Irish Soda Bread while you’re at it. The kids will eat that up at least. I like to cook this over two days—it makes it a more leisurely task, allows for easier skimming of fat, and deepens the flavors. Day 1: Preheat the oven to 350°F. Add the beer, onions, garlic, brown sugar, ground mustard, ginger, and the chile to a roasting pan large enough to hold the corned beef, and stir to combine. Add the corned beef to the pan, along with any remnants of the corning spices stuck the the beef (or the packet that came with the beef), fatty side up. If the liquid is not covering most of the beef, add more water until it is. Cover the beef with a double layer of parchment paper, then wrap the pan tightly with aluminum foil. Place in the oven and cook for 2-1/2 to 3 hours (less for smaller cuts of beef, longer for larger). The beef should be almost but not quite fork tender. Remove from oven and allow to cool to room temperature, then remove to a separate storage container and refrigerate overnight with all the braising liquid. Day 2: Again preheat the oven to 350°F. Remove as much congealed fat from the beef as possible and discard. Take the beef and place it back in the roasting pan. Strain the remaining liquid back over the beef, and discard the onions, garlic, and spices. Place the beef back in the oven, with no cover this time. It's better if the beef is not entirely submerged in the braising liquid, in order to create a sort of crust on the top of the beef. The beef should cook for another hour or so. While the beef finishes cooking, fill a large pot with water and add the potatoes. Salt this water well and bring the potatoes to a boil. As soon as it hits a boil, add the carrots. Cook until both vegetables can be easily pierced through with a sharp knife, around 15 to 20 minutes. Use a slotted spoon to remove the potatoes and carrots to a bowl, and then add the cabbage back into the boiling water. For Napa/Savoy cabbage you only need to cook it around 10 minutes or so. If you are using more traditional green cabbage, it could take closer to 20 minutes. Strain the cabbage in a colander and drain well. Add the butter back into the large pot so that it melts, along with the cabbage, potatoes, and carrots and stir to combine. Season with the salt and white pepper to taste. 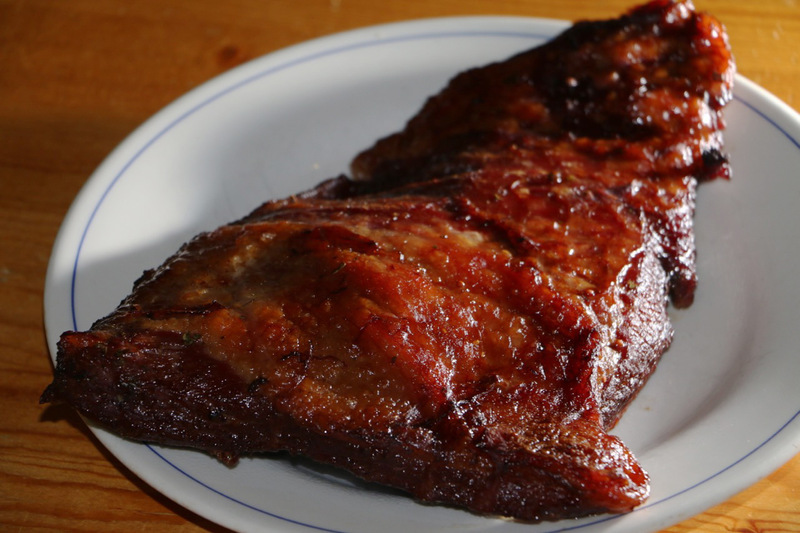 To serve: Allow the beef to cool in the braising liquid until it is safe to handle, then thinly slice the beef across the grain (this often means cutting it along the "wide" side of the beef, if you can't easily tell). Spoon a few tablespoons of the braising liquid over the beef and portion out the vegetables, along with a dollop of whole-grain mustard. * Our local butcher sells barrel cured corned beef, which I highly recommend. But the packaged stuff will always do in a pinch. ** I prefer Napa or Savoy cabbage for the more tender and delicate leaves, but the more traditional green cabbage works fine too!